A 400 denier Polyurethane Coated Nylon Pack Cloth is used to make most duct plugs. Calculating the approximate weight of a pneumatic structure made of our stock material is fairly easy. Heavier duty materials such as 1000d Ballistic Urethane Coated Cordura and Silicone Coated Continuous Filament Fiberglass Fabrics essentially double the weight calculations used in this theory. Most of our barriers are constructed at an extruded depth of 58". This increase in depth allows more grabbing and sealing surface to be used when blocking off an area. A duct measuring 10' wide by 10' high would require a balloon to fill the volume of 10' x 10' x 5' or 500 cubic feet. This balloon would weigh approximately 32 lbs. Constructing barriers using fabric has a great advantage when it comes to transporting the necessary goods required to block a large area. This is especially true when comparing the raw goods it would require to plug the same area using scaffolding, plywood or other flat materials. The same balloon mentioned above, 10' x 10' x 5' inflated size, packs down to size of approximately 3 cubic feet. Small enough to be handled in a duffle bag. Each inflatable we ship out comes in a fabric bag that can be used for shipping and storage. These bags are resilient and offer protection to the sewn goods and also have handles for easy maneuvering. Larger balloons are shipped after being wrapped in custom, heavy duty tarps made from 10oz Polyester Coated Vinyl and secured tightly with webbing straps and d-rings. Completed units leave our dock via UPS, FedEx and LTL common carriers. 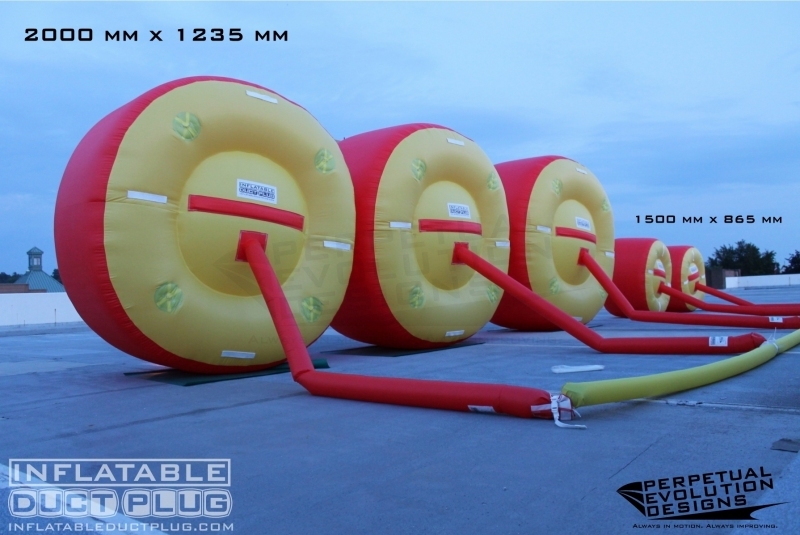 The PED-1.5/115 is the standard blower used for most of our inflatable products. 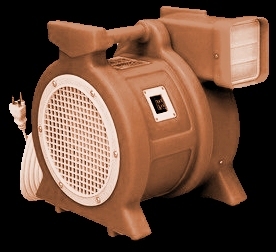 Some projects require a less powerful fan, while others can require a more powerful unit and sometimes even multiple blowers. The PED-1.5/115 is applicable to 85% of the balloons we ship out. It's housed in a compact light weight high impact roto molded housing with an easy to carry handle and "reverse air louvers" that prevent back flow. Maximum static pressure - 9.8/"
Unit Size ( L x W x H ) - 17" x 13.5" x 17"
Shipped Dimensions ( L x W x H ) - 20" x 15" x 18"